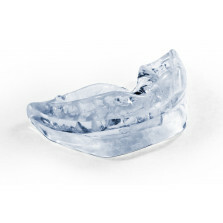 Nasaline® Snooze is a unique device used to enhance breathing, improve sleep, and reduce snoring - naturally. It was designed by a team of Swedish ear, nose and throat specialists, and has been used by sleep clinics and hospitals since 1998. 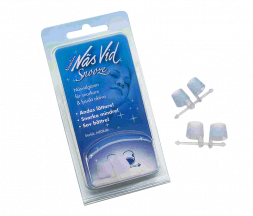 Nasaline Snooze consists of medical grade silicone, is completely latex-free as it was specifically designed for direct contact with the skin. Average life time is around 6 months. Nasaline® Snooze was designed in sizes Medium and Large - and will fit most adult noses comfortably. The adjustable connection-cord was designed for a perfect fit regardless of distance between nostrils. Comes in MEDIUM or LARGE. Most women prefer medium and most men large. Utilizing two silicone baskets that are inserted into each nostril, Nasaline® Snooze gently expands the nostril openings, allowing for more oxygen to enter through the nose. 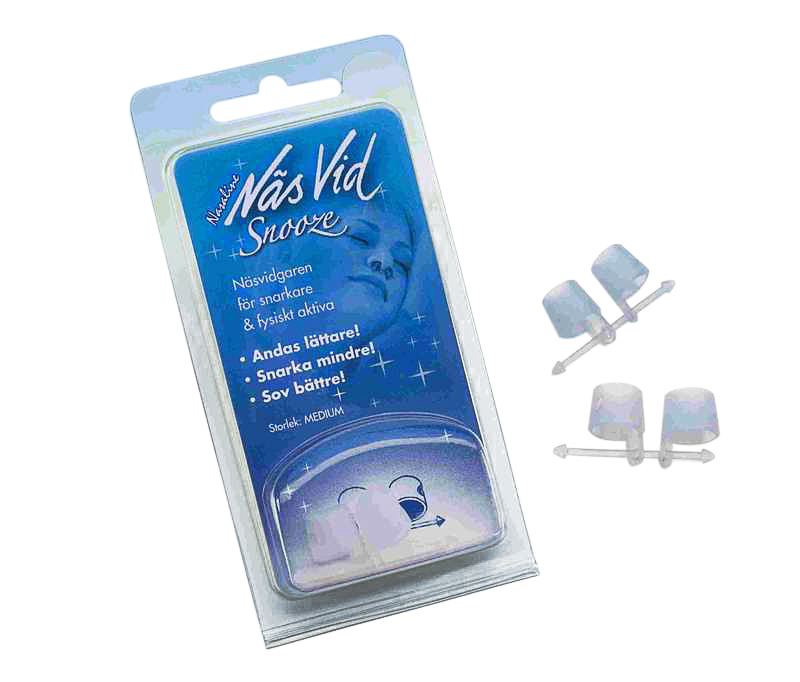 Snooze Nasal dilator also prevents nostril collapse. Nasal dilation, as the process is called, is a well established treatment for those who snore because they suffer from nasal stuffiness. Snoring is often caused by the relaxation and slight closing of the nasal passages. Normal respiration takes place through the nose, which filters and warms the air by contact with the capillary veins in the nasal passages as inhalation takes place. A snorer, who breathes through the mouth, inhales a greater volume of cold air. This accounts for the dry, raspy throat in the morning. The sound of snoring is created by the vibrations of the soft tissue at the level of the uvula in the palate / tonsillar area. The Nasal Dilator gently supports the nasal passages, encouraging normal respiration, and ameliorating the snoring problem. Try to combine both Snooze and SnorBan for a total widening in both nose and throat. This will give you enough oxygen constantly and your breathing becomes lighter. Resulting in less turbulence and less vibrations. And the snoring sound will stop. Or at least be a lot less loud. Better breathing in open airways. Stop snoring has never been easier. Individuals who suffer any condition that affects the nasal passages will find it difficult to breathe at night. This encourages 'mouth breathing' and snoring as a consequence. 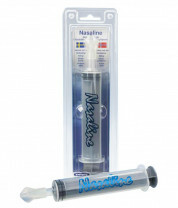 Using Nasaline Irrigator, which is safe for long-term use, can reduce nasal congestion. For me this works like a dream! I can breathe, no longer wake up in the night/morning with a headache and sore throat and am no longer bannished to sleep in the spare room! MUCH more effective than the stick-on nasal strips. My doctor recommended Snooze and I'm so glad she did. Wow, this simple device works. I can breath clearly through both of my nostriils - I have a deviated septum. Much better sleep, also stops me from drooling on my pillow as previously I had to sleep with my mouth open to be able to breath. This definitely makes a difference to my partner's snoring, though it has the tendency to fall out of his nose in the night. If we have to replace it every 3 months, I will try to get him the larger size. This little device does really help snoring, even if it doesn't get rid of it altogether. As I have aged I started to snore and it became quite a problem. Snooze has allowed us to continue to sleep in the same room! I have been using Snooze Nasel Dilator for about a year and its great, I do get a better nights sleep. I've now been using the Snooze product for the past 2-3 years and having tried many other products, find this one to be superior in what it achieves, it doesn't stop the snoring completely, but my wife tells me that the volume I do snore at is very low, such that she can now get a good nights rest. This device does exactly what it says and reduces snoring (although it may not totally prevent it). It's easy to use and is comfortable and unobtrusive. I would certainly recommend it. It didn't stop me from snoring unfortunately but I can definitely tell that it makes me breath more easily at night (similarly to what nose strips do). So still a a good product but didn't do what I expected it to do. This thing seems to work really well. I use the SnorBan and Snooze at the same time. The SnorBan makes you breathe through your nose so, if you find that your nose dilates when you breathe through it, then the Snooze is a useful aid to keep your nose 'open'. After many years suffering from allergic rhinitis my nasal passages have become very restricted and narrowed. I found sleeping difficult. I would breathe through my mouth causing dryness, headaches and disturbed sleep. Snooze are terrific believe me! They gently open the nose to allow a free passage of air. They are very easy to use and make a real difference to your quality of life because no more broken sleep!! This works for me reasonably well. It does fall out sometimes. Have used these for over 5 years and have found them the best tool to retard the closing up of my nasal passages preventing me from breathing. I've been looking for years for something that would work this well. It hasn't fallen out, and now I can turn my head both ways, whereas before I had to sleep on one side. This is a lot cheaper than buying disposable nasal strips. And it works well as long as it stays in your nose. But each morning I wake up it has fallen out some time in the night. Maybe if you are a sound sleeper and do not move around too much then you will not have this problem. So it works great for as long as it stays in.